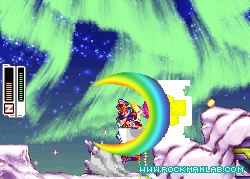 Since its launch in late July, Mega Man ZX Prequel – a fan-game set 200 years before the events of Mega Man ZX – quickly become a favorite among Chinese-speaking Mega Man communities. 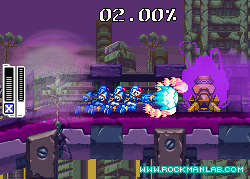 And recently, with the announcement of an English version, developers Rockman Labs hope it will catch on overseas. According to project lead Sousou, the English (and Japanese) translation started production a couple weeks ago. It's being developed concurrently with a new version of the game based on fan-feedback. In the meantime, the original Chinese version is primed and ready to play. You can download it here or here. Take note, there are some compatibility issues with the latest version of Windows 10. 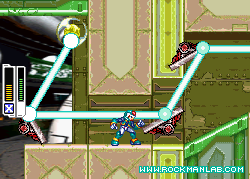 Though you won't get much out of the story right now (from what I've gathered it concerns the spread of a lingering Reploid virus), gameplay is fairly easy to pick up on. If you played ZX, ZX Advent or any game from the Zero series, you should be right at home. Unique to ZX Prequel, though, is a light/dark world system. In the light world, you'll occasionally run into virus-infected mechaniloids. However, in the dark world, ALL enemies will be infected. Light or dark, enemies infected with the virus are said to be stronger than the norm. A gauge at the top of the screen shows you just how bad the outbreak is in your current position. I'll be checking the game out this weekend, but it sounds rather tantalizing. We don't get enough ZX fan-games! Hit up the links above and give it a download! Just like critically acclaimed fangames like Mega Man Unlimited and Mega Maker. Hell, Capcom even took Street Fighter X Mega Man, which was a fan game originally, under its wing and published it. Of course, Capcom COULD pull the plug on this if they wanted, but they're pretty chill about this stuff. No, they're using capcom's sprites (and most likely the sound effects too) instead of creating their own sprites. Doujin games rule is that you have to create all of the assets from scratch. But in the end, it all is in capcom's hand whether they want to C&D it or not. It won't be easy for capcom to take them down since these guys live in China. Using stolen assests to create fan-game is never fine. They just lucky because Capcom choose to ignore it. Please let us know when the translation is complete! It sad that if the actual MegaMan ZX games came out today... They probably would've sold amazingly. When they released, everyone pretty much ignored them. Looks like they let you play more of Model X this time around. So... it's a direct fan-sequel to Mega Man Zero 4, then? Wenk. Hasn't that been put on indefinite hiatus since March though? really? they could have at least put in some effort on the sprites and used Giro's model Z form, instead of reusing model ZX. I've tried this one out. Level design's kinda bad, and the boss gauntlet is way too punishing. On top of that, the fights are glitched half the time. I'm guessing they won't be spending that much time on ZXG though, because they're focusing on their own original platformer. The most interesting thing they did was tease Return iX at the end, but he'd fit a lot better in a Mega Man X fangame. From what I understand, this Chinese fangame is already complete, but I'm only hearing about it now. Better late than never. +1 for reusing assets to put a game out sooner rather than later. Im not sure which alpha test you were playing, Considering that the level design isn't even final nor the bosses either, they were trying to stress test the game to see how they can get it closer to the original design, while adding on newer features. They already made it clear that in the future when making their own levels and tiles they would be balancing the game. If you haven't read their post on the Alpha Test 3, they we're trying to get better screen resolutions instead of a normal box that you see in most MM fangames or DS emulator, while focusing on Model F and Model P's strengths. Which alot of people playing the alpha test weren't using their brains and blamed it on bad level design, because they couldn't use their favorite models. Which there would be no point in playing a ZX game if lets say you used Model Z all the time, might as well go back to play the Zero saga. Just in case anybody was wondering. Yes, you can Command Dash off walls in this. I just wanna say. This game is utter crap. The level design is crap. The mechanics are so dang punishing and there is no notice for most of them. You essentially HAVE to die if you want to even PLAY this game. 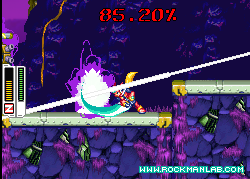 The Megaman bosses are retardedly overpowered. All in all this game is crap. I have played through this game on both Nett and Elf and I can say that it is garbage. The normal easy mode is even harder than any expert mode on any real game. Learn to make a game that isn't just a "Hard mode" game. Idiot. Heh, if this game is hard for you then that means you never played megaman zx, zx advent or even megaman zero.If you don't like this game then DON'T play it! I've actually BEATEN all 6 of those games. Those are WAY easier than this trash. One thing that most megaman games had going for them is the ability to teach players as they play and gradually increase the skill cap. This game does none of that. that's why it's trash. For some reason when I try to run the game it only reaches 30 fps framerate. Is there a setting I should be using or something I should do to fix this. The game only runs at 1/2 speed as a result.